Even excluding the totals from today’s turn-out (which was the final day for early voting in Louisiana and was, by all accounts, the busiest day so far), the Great State has already experienced a 169% increase in early voters, compared to the 2004 election. These are remarkable numbers, and they certainly undercut any argument supporting a double-digit McCain victory in Louisiana. It would be naive to ignore our State’s demographics and even more naive to downplay the significance of early voter turn-out, as evidenced by the three to four hour waits that many of my friends experienced when voting in New Orleans today. Although, empirically, early voting (previously known as absentee voting) favored Republican candidates, the enthusiasm gap coupled with Louisiana’s voter demographics would seem to favor Senator Obama and down-ticket Democrats. Already in Rapides Parish more than 7,600 people have cast votes in this election, nearly 42% of whom are African-American. Indeed, well over 58% of early voters in Rapides Parish are registered Democrats. The same trends can be found throughout the State. I may not need to state the obvious, but I’ll do it anyway: This looks great for Obama and the Democrats. If the early voting trends hold steady, Obama will win Louisiana. If Obama receives between 10% and 20% of white voters, assuming the turn-out numbers remain consistent, he will win Louisiana. Even if one applies the internals of the latest Rasmussen poll in Louisiana (which are, understandably, proprietary and prohibited from being republished without expressed consent), Obama will win Louisiana, provided the trends remain substantially the same. (And remember, that same poll had McCain up by over 15 points). Simply put, the polls here may be proven to be woefully inaccurate, having dramatically discounted the dynamics of an increased turn-out. hope you’re right. It would certainly be a shock, but I think that regardless of whether Louisiana will flip for Obama the gap will be much lower than most people thought possible. There is definately a major wave brewing and I think a close outcome will ensure that democrats don’t ignore the state in future elections. Paul, I’ve always felt Louisiana has been under-polled and unappreciated by the national pollsters and media. An Obama victory would not be surprising or shocking here in Louisiana, regardless of Rasmussen. Notably, although Rasmussen tells subscribed members about its breakdowns, it does not reveal how its polls are weighted. 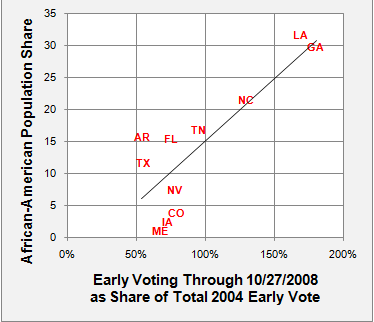 The early voting numbers validate what I have always believed about our Great State: Assuming, like Rasmussen, 97% of African-Americans in Louisiana vote for Obama (which is basically what every pollster believes), the only way McCain could be leading by 15 points is if less than 10% of whites support Obama. Yet even Rasmussen’s internals indicate that whites support Obama by at least 20%. This severely calls into question their sampling pool and the objectivity of their projections. The lines for early voting were out the door several times that I was in the courthouse. Good to see folks so interested in the process. I’m not at all being a smartass Lamar, but it seems everywhere you read or look “the polls” say McDude has the Louisiana lead. Interesting story though. Let’s assume 97% percent of blacks vote for Obama. Given the broad range of social, educational, religous, and financial backgrounds of all the black folk in this state, can they all be voting for him because of his platforms? Or, is it simply because he is black and his platform is irrelevant? Many of these folks say they are voting for Obama because it’s time for change (I do agree that change is needed) yet very few of them can actually articulate the answer to one basic question…change, from what to what? nothing is going to change for them. the welfare recipients will just get a larger piece of someone else’s pie. are going to delete this comment, frederick? Nope, not this time, Mr. Danny L. Cook. thats Daniel, Danny is my dad. With the mounting bad news for their campaign, McCain/Palin will have no choice but to go increasingly negative in their attacks. Anybody else see this leaked 527 spot? You’re obviously a very opinionated and passionate young man (not sure how young, exactly, but I know how old your father is), and though we may disagree, I always enjoy a good debate. Your e-mail account is actually registered to your father, for some reason. As people who share family, let’s agree to end any hostilities. I respect you and your family, and frankly, I don’t think it’s productive for either one of us to be combative. I deleted a previous comment you left because I felt it was mean-spirited, as did members of our “shared” family. We can have substantive disagreements without being snide or rude, and if I have offended you personally, then I sincerely apologize. That said, I wonder what on earth you mean when referring to welfare recipients. I have never read anything or heard anything about increasing welfare entitlement programs from either candidate. for the record i am 37. as far as the yahoo account, dont know, i personally opened it 6 years ago when i started working for myself. as for our ongoing “discussion”, the thing that gets me is when you say you respect someone and in the same breath you call them ignorant. to make matters worse i take a shot at you and show myself to be a hypocrite. Lamar, i appreciate your passion and willingness to get involved in the process as you have. i leaned to the left in my younger (college) days. not to the extent that you are, but to the left none the less. once i got married and had kids i realized there were things that i wanted taught in the home and not in school. i suspect you will tach to the right a little when (or if) you get married and become a parent. Alot of people do. one thing i want you to know that if Senator Obama wins Tuesday that i will respect the man and call him My President, as long as he respects the office. this is where my biggest problem lies. I was told once that when you are in a leadership position you must hold yourself to a higher standard and be beyond reproach b/c people are always watching. In school, on the ball field, out in public, etc. i think we have lost respect for the office b/c of what happened in the 90’s with President Clinton (and Nixon to a degree) Although most younger people today have no clue about him. my opposition to Senator Obama is simply that we are polar opposites in our personal beliefs. i have heard things he has said about abortion (not wanting his daughter punished for a mistake) and comparing the doctrines of nazism to our country. i could go on and on, but it just would not matter. so we will have to agree to disagree. Yes, you are who I thought. I don’t believe you are ignorant or a hypocrite; I just don’t understand why you have, in the past, shown personal antipathy toward me. I suppose you thought you were protected by a quasi-anonymous screen name. That said, I concur: I will agree to disagree. No, i wouldnt have shared the things with you that i did had i not wanted you to know who i was. that being said, if you look back on some of the posts i tried to play nice, but felt you were not. maybe it was just the way things were typed. my post about the people down south (after katrina and rita) waiting around was not second hand information. i do loss control work and spent the better part of a year down there. i’m not trying to change your mind or convince you otherwise, but i saw it first hand. the welfare state and dependency on the govt shined brightly. just wanted you to know where i was coming from. it wasnt personal. i actually defended you several times on”antics” blog. Santa Claus, the Easter Bunny and the Tooth Fairy together can’t deliver Louisiana electorate for Senator Obama! High voter turnout is a positive sign for United States. However, it doesn’t mean that voter sentiment will suddenly surge for Obama. So, enjoy your fantasy for five more days that Senator Obama will win Louisiana and its electoral votes.